You’ve come a long way, Enid. If you’ve ever been to Ellen’s Stardust Diner on Broadway and 51st in Manhattan, then you know why Enid here was advertising for a husband on a subway. 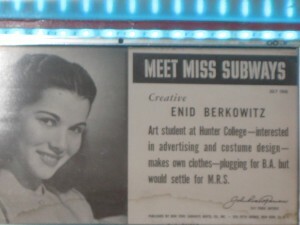 Her poster was one of many to appear on subway cars from the 1940’s to the 1970’s to draw more attention to ads on subways. Each woman was a monthly pageant winner, some of whose posters now appear on the diner’s wall, largely because the Ellen in Ellen’s Stardust Diner was a Miss Subway in 1959. Women competed for a shot to be the Miss Subway of the month by submitting their photos and bios for voting. Some of the women aspired to be anything from mezzo-sopranos to teaching economics. But a few had other plans, including Enid. Enid’s poster is the one that hangs near the diner’s Ladies’ room on the second floor. It says she was a Hunter College art student who was “plugging for a B.A. but would settle for M.R.S.” For those of you born long after Title IX and “Free to Be You and Me,” that means she’d quit college if she could find a husband. Get it? Her M.R.S. degree? Here on the eve of BlogHer ’11, where some 3,000 bloggers will gather to talk shop, schmooze with sponsors and learn the best ways to make money from their blogs,I thought it would be a great time to remember how far we’ve come, baby. And to imagine what we could all do with the kind of amazing free advertising space that Miss Subways provided. I Don't Miss the Playground.